Immigration also concerns California residents, although Trump’s ratings are low. California Gov. Gavin Newsom presents his first state budget during a news conference, Thursday, Jan. 10, 2019. An eye-opening 70 percent of California adults favor Newsom’s budget ideas in general, according to the survey by the Public Policy Institute of California, a nonpartisan statewide research and policy organization. 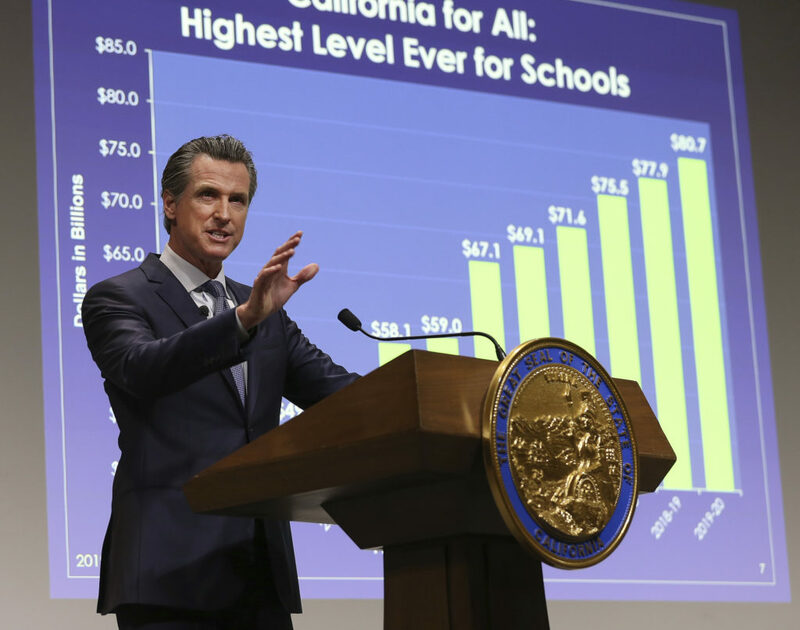 Support for Newsom’s extra education spending was even higher: 77 percent for his plan to bolster early childhood programs and 78 percent for his proposals to add higher education funding. Newsom “is having a very strong start to his time as governor. Lots of hope and expectations about what he is going to do. And a lot of positive feelings about his overall approach to the budget and his emphasis on spending for both early childhood and higher education,” Mark Baldassare, PPIC president and CEO, told EdSource. “Cradle to career is a very popular idea right now and in some ways is an idea whose time has come,” Baldassare added. He was referring to the philosophy Newsom has adopted about extending learning throughout life. 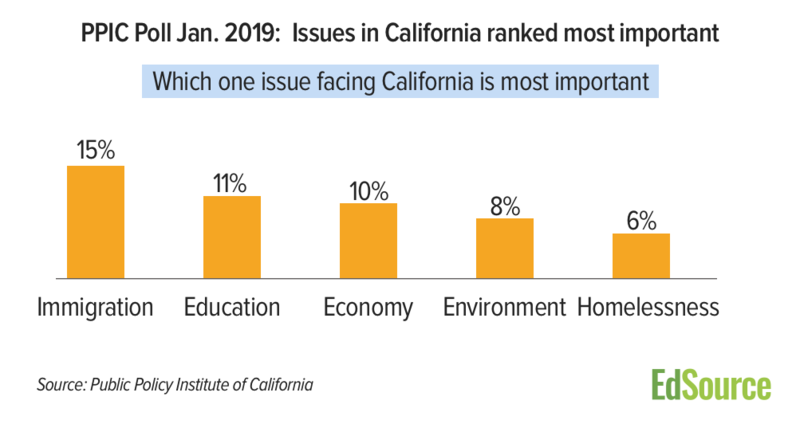 However immigration and illegal immigration emerged in the PPIC survey as the most important issue for state government to work on, cited by 15 percent of adults across California. That was up to 22 percent in the Central Valley, where issues about farm labor from other countries loom large. Education, schools and teachers ranked second statewide among issues, with 11 percent. Next came jobs and the economy (10 percent); environment, pollution, global warming (8 percent) and homelessness (six percent). Given lower priority were healthcare, housing costs, infrastructure, water and crime. Education received the most support (16 percent) as an issue in the Los Angeles region, a focus that Baldassare attributed to the partial timing overlap between the polling and the six-school day teachers’ strike in Los Angeles last month. The strike brought statewide attention to issues of teachers’ pay and classroom size, he said. The PPIC survey reflects the opinions of 1,707 California adult residents around the state, with 1,195 interviewed on cell phones and 512 interviewed on landline telephones from Jan 20-29. The margin of error was estimated to be plus or minus 3.3 percent. 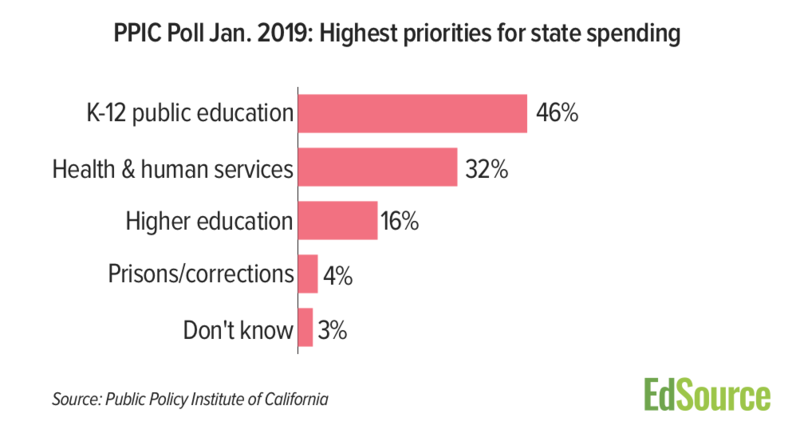 Another recent poll, by the nonprofit policy and research organization PACE and the USC Rossier School of Education, found that keeping students safe from gun violence and making college affordable were the most important education issues in California. Those issues scored more highly than early education. The new PPIC survey did not specifically ask about violence or college tuition but Baldassare noted that his organization’s November poll found strong support for state funding that would freeze tuition or provide free tuition at state colleges and universities. In the latest PPIC survey, Newsom received high personal marks just weeks after his inauguration. Forty-four percent of adults approved of the way he is handling his new job, 23 percent disapproved and the rest either didn’t know or had not heard enough to form an opinion. Newsom’s support was strongest in his home San Francisco Bay area (52 percent) and lowest in the Inland Empire (36 percent). Not surprisingly, a partisan gap is apparent with 63 percent of fellow Democrats high on Newsom compared to just 16 percent of Republicans and 37 percent of independents. His rating was slightly above Gov. 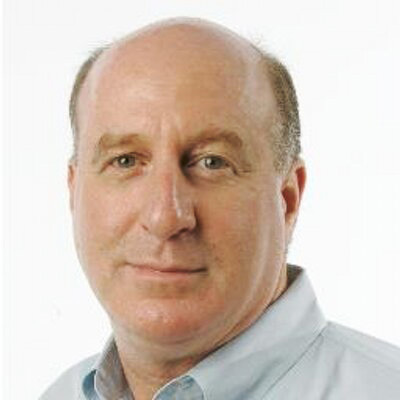 Jerry Brown’s 41 percent when the former governor started his third term in the office in January 2011. Those results contrast with the poll’s findings about President Donald Trump and his policies. Just 30 percent of California adults said they approve of Trump’s job performance and 67 percent disapproved. Speaker of the House Nancy Pelosi (D-San Francisco) did better: 48 percent approval and 39 percent disapproval. Two-thirds of the poll respondents said they thought “things in the United States are generally going in the wrong direction” and a majority disapproved of the way Congress is operating. In a controversial California issue, state residents showed strong support for Proposition 13, the 1978 ballot measure that tightly limited property tax rates after purchases. Sixty-one percent of poll respondents thought that the proposition has proved to be mostly a good thing. However, they were more evenly divided about a likely 2020 ballot measure that would create a “split roll” by lifting the proposition’s protections from commercial properties. Forty-seven percent of the poll participants favored that split roll while 43 percent opposed it. Those findings should worry split roll proponents, according to Baldassare. They “will have a lot of explaining to voters do as to why this is going to be a good change to something that most people generally feel has been a good thing for California,” he said. Earlier in the month, the PACE poll found greater support for the “split-roll” approach which would raise an estimated $11 billion, of which about $4 billion would go to schools and community colleges. In that poll, respondents back the idea 55 percent to 35 percent opposed, with Democrats favoring it 69 to 21 percent and Republicans opposing it 42 to 51 percent. Business groups are vowing an expensive campaign to defeat the initiative. I see more business owners leaving. With nearly 50% of Californians not paying taxes, now and businesses leaving, the deficit or taxes or both will increase. Very sad for California.